It's no wonder Google's new Pixel and Pixel XL smartphones have turned heads. Their high-quality builds and sophisticated look are a far cry from the cheap, pedestrian Nexus Android smartphones Google used to sell. And with the battery debacle forcing Samsung to drop its Note 7 from the market, the stylish Pixel XL is an obvious alternative. But for enterprise use, the Pixel is too rough around the edges to deploy. IT and users will be befuddled by the networking naïveté in the Android 7.1 Nougat operating system the Pixel runs on. Great hardware doesn't fix poorly designed software, and it's clear that Google's Android engineers haven't a clue about enterprise environments. I got an inkling of this naïveté when I set up the Pixel XL. It wanted to connect to the local Wi-Fi network. But it doesn't know how to navigate protected networks, such as our Cisco wireless LAN, and I could not figure out what it wanted to connect to on our corporate network. I entered info for all the fields -- authentication method (such a PEAP), authentication type (such as MSCHAPv2), domain, username (identity), anonymous identity (group), and password -- and told the Pixel to use the system certificate, but the Pixel kept telling me authentication had failed. I never did figure it out. Apple's iPhone, by contrast, knows out of the box what to set up for such networks, so it immediately can be used in corporate environments once you enter your username and password and accept the network certificate. Samsung's Galaxy S7 needs only two extra pieces of information -- your authentication method and your anonymous identity -- to connect to such networks. This secure-network sign-in issue is not new -- what the Galaxy S7 seeks is what any Android device seeks, and it's information that the device shouldn't have to ask the user to know. I talked to a Google engineer about it several years ago when Android 4.0 Ice Cream Sandwich was released in 2011, and even then it was a known issue (from as far back as 2010's Android 2.3 Gingerbread) that was on the road map to be addressed. It clearly fell off the radar. Worse, the issue has grown worse in Android 7.1. It's actually Android 7.1 that wants all the extra information beyond what Android used to seek, not the device per se. Only when I installed the Android 7.1 beta on Google's Pixel-C tablet was I asked for all that network configuration detail. (The Google Pixel didn't ask for that detail when running Android 7.0 Nougat or 6.0 Marshmallow.) As with the Pixel smartphone, I could no longer log into the corporate network on the Pixel-C tablet once Android 7.1 was installed. I tried to sign in via our guest network to complete my setup. The Pixel connected to the Wi-Fi network but could not load the login page (the same kind you might get at an airport or hotel when using Wi-Fi there, aka the captive portal) to actually complete the Wi-Fi connection. Ditto for the Pixel-C tablet, which even displayed an error that the CaptivePortalLogin service was stopped -- clearly, more Android 7.1 nonsense. By contrast, the iPhone and Galaxy S7 both opened the login screen needed to complete the connection. I ended up using my iPhone as a hotspot to continue login. I could have used the Verizon SIM that came with the Pixel instead, of course, but I didn't want to shut down the Pixel to insert the SIM. The point remains: You should be able to use corporate Wi-Fi networks to set up and use the Pixel, but you can't. If that had been the only hassle, I would have been fine. But the Pixel demonstrated more naïveté as I continued to use it. Users and IT admins shouldn't have to put up with the Android 7.1 nonsense in the Google Pixel -- and if they get an iPhone or earlier Android device, they wouldn't have to. Now that my Pixel smartphone was set up, I tried the guest network again, and this time the login screen did appear. Great! I decided to see if I could join the protected network -- still no luck (I never did get it to work), so I switched back to the guest network. For whatever reason, the Pixel needed the username and password reentered for the gest network -- but it wouldn't display the screen to enter those credentials. I had the Pixel forget the guest network and tried several times to reconnect to it before I finally got the prompt that opened the sign-in screen. Since then, I've been properly prompted for the username and password each time I want to reconnect. With the Pixel finally on Wi-Fi and my apps downloaded (I had backed them up from my other Android phone so that Google knew what to install), I tried to set up Microsoft Outlook via the Settings app. That seemed to work, but when I went to Outlook, there was no connection. And Outlook was missing in the Settings app's Accounts page. I set up Outlook again, this time in the Outlook app, and discovered the issues. One is that Android 7.1 doesn't know how to connect to Office 365 accounts, only on-premises Exchange. I had to dig up my Office 365 settings from my iPhone and manually enter them on the Pixel. The other is that each app for which you set up Exchange access needs your permission for Exchange policies to manage your phone, but Settings doesn't ask for this permission. Thus, you should set up your Exchange accounts individually in each Microsoft app, not in Settings. After that, Outlook worked fine, and the Pixel knew my credentials for the Office apps. Great! The OneDrive access in the Office apps was also set up, but the OneDrive app itself was not -- a disconnect that also occurs in iOS and Samsung devices. Note that a later update to Microsoft's Outlook app added Office 365 settings to the Settings app's Outlook account setup. Clearly, Microsoft was the culprit there, not Google. Then I decided to use Google's Gmail for both personal and work email, which is more convenient than switching apps. (I know: Many IT pros hate that idea.) I added my Exchange account credentials, then got an error message that my device's security settings needed to be updated. (Yet they had worked in Outlook.) I tapped the Continue button and got the same error. Infinite loop! It turns out the version of Gmail preinstalled on the Pixel has a bug, which an update fixed. Once I installed the update, Gmail could access my Exchange email. It's clear that Android 7.1 is a work in progress, as are Microsoft's apps. That's not a good combination for business users. Beyond the enterprise naïveté, how is the Pixel? Well, it's a nice phone, clearly inspired by the Apple iPhone and Samsung Galaxy S7 in its look and feel. It has all the specs that matter. It feels good in the hand. The camera is not quite as good as Apple's or Samsung's, but what does that matter in a business phone? We're way beyond good when it comes to phone cameras these days. My only beef with the hardware is the positioning of the fingerprint scanner on the back of the device. The location makes it much harder to unlock the device and get going. You have to press the power button on the side, then get your finger on the sensor. On the iPhone or Galaxy S, you simply press on the home button to do both actions. Plus, with the Apple and Samsung devices, you can quickly wake the device when it's on a desk via a tap on the Home button (which is also the fingerprint reader) without having to pick it up first. The Pixel must be picked up to be unlocked via a fingerprint. You can click the power button and enter your password, of course, without picking up the Pixel. The location of the fingerprint scanner also makes it a little harder to use services like Android Pay and app unlocking. 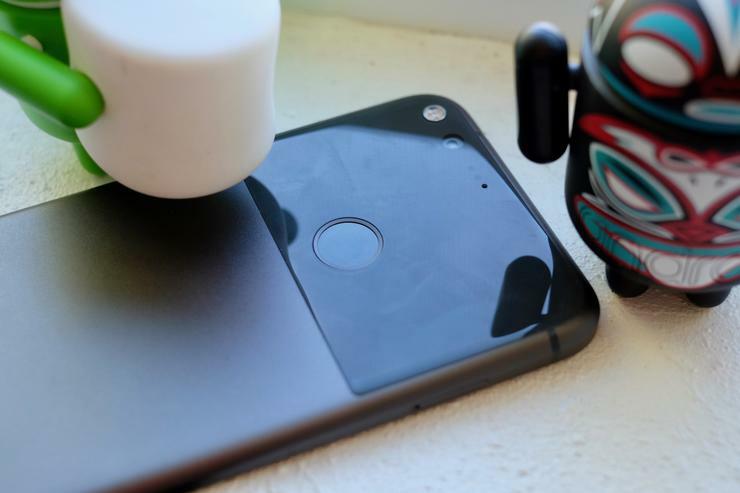 For fingerprint IDs, the Pixel is unnecessarily less convenient than its main competitors. The Pixel smartphones are marketed as initially available only for the Verizon network. As I was reminded on a recent trip to Los Angeles, Verizon's network is poor in many regions of the country, especially (in my experience) the South and Midwest. (AT&T is poor in other areas, like Northern California and New York.) Single-carrier smartphones are a bad idea for enterprises, which typically have multiple office locations and traveling employees. Luckily, the Pixel is unlocked, even the ones sold by Verizon itself, so you can use it on other networks, including AT&T, Sprint, and T-Mobile. The new Android 7.1 Nougat introduces a couple of UI changes that may throw users at first, such as the slide-up app window. But most of the changes (there aren't many) are slight improvements, such as the quick-access slider in Settings. The Pixels are nice smartphones, comparable to other Android flagships. But the Pixels suffer from Android 7.1's naïvetė about the corporate world, even more so than previous Android versions. An iPhone is the best corporate phone, both for iOS's maturity around enterprise needs and the strong app portfolio that comes with it. A pre-7.1 Android smartphone is your next best bet, especially the stylish, highly secure Galaxy S7. Android 7.1 needs to be fixed before the Pixel should be on your supported-device list.